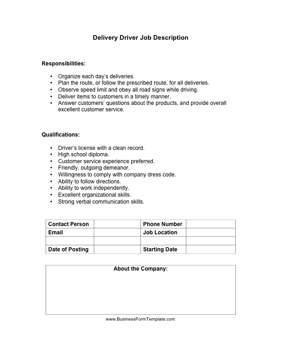 A delivery person's driving, speeding, planning and routing requirements are all covered in this delivery driver job description that can be used for advertisement purposes. Plan the route, or follow the prescribed route, for all deliveries. Observe speed limit and obey all road signs while driving. Deliver items to customers in a timely manner. Answer customers' questions about the products, and provide overall excellent customer service. Willingness to comply with company dress code.